FC Barcelona B put on a divine performance Saturday night in Alicante, overpowering Hércules by a score of 3–1 in Week 2 of the Second Division B. Well aware that their visit would require an impressive show of strength to take down the team which shares its name — and laborious reputation — with the renowned hero of Roman classical mythology, Barça B outworked Hércules at both ends of the pitch and got a goal from Marc Cardona halfway through the first minute of play (yes, at the 30-second mark), before second-half strikes from Perea (min. 53) and Mujica (min. 88) definitively felled the hosts in an epic, early season battle at the Estadio José Rico Pérez. Seven minutes after Cardona's surprise opening score, Hércules drew level when Miñano converted from the penalty spot after Barça B were whistled for a foul in their own area. Barça had a shot to retake the lead with a penalty kick of their own, but Perea's spot kick was well-read by the Hércules goalkeeper, whose save kept the scoreboard intact. Hércules came out of the dressing room after the intermission focused on capturing the lead. But eight minutes into the second half Perea's steal deep in Hércules territory ended with him putting the ball in the net to stun the hosts and give Barça the lead. Aggressive attacking took hold at both ends, but Rafa Mujica, who came on as a substitute in the 74th minute, notched Barça's third goal of the evening just two minutes from time. 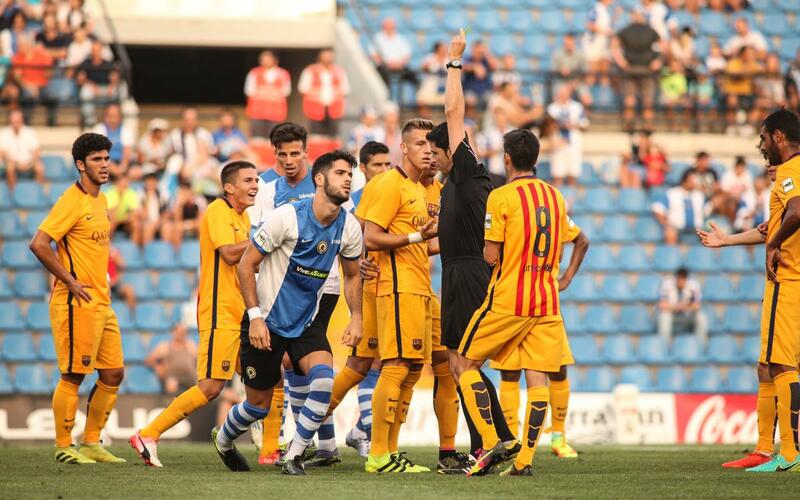 The victory is Barça's second in two games this season, a great start if history is any sort of guide.